The Pocket Protector holster is designed for front pocket carry in pants or a jacket. 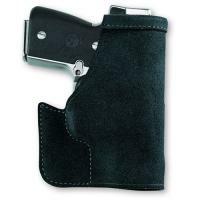 The Pocket Protector keeps the firearm in the same general position so you can quickly locate the grip when you need to draw, conceals the shape of the gun so that its outline is not printed through the pants, and allows one-handed release of gun from both pocket and holster. Reinforcements at the holster mouth and beneath the trigger guard keep the holster stiff enough to allow a smooth draw and easy return to the holster, while also maintaining enough rigidity to prevent “printing” and shifting of the handgun. The holster’s hooked shape – at the base of the handgun’s trigger guard – is designed to catch on the pocket so that, with practice (using an unloaded firearm) and while using the proper pants, you can draw the firearm while the holster remains in your pocket or falls away. The Pocket Protector is ambidextrous and constructed of premium Center Cut Steerhide. Pocket Protector for NAA mini-revolvers includes a flapped pocket for spare rounds. Love this holster. Keeps gun snug, but ready while in your pocket. Average holster, doesn't fit Glock 42 very well. Very bulky for a pocket holster. Great fit for the SW bodyguard. stays well in pocket when drawing. Secure fit with the gun, holster stays firmly in my pocket when unholstering the gun.